News > Rainbow Set To Unleash More Of Its Magic At MIP 2017! Leading studio Rainbow will be presenting magical new content at MIP 2017, with three new series. These are new seasons of global smash-hits Maggie & Bianca Fashion Friends and Regal Academy, and the brand new preschool show 44 Cats! 44 Cats is a sumptuous 52 x 13’ CGI preschool comedy series that follows the daily adventures of Lampo, Milady, Pilou, and Polpetta; all of them are part of a music band named The Buffycats. These four kittens are homeless and get shelter in a garage, transforming it in a “Clubhouse” – a place where all cats from the neighborhood get together to have fun and relax! Storylines explore the themes of friendship and altruism: the main characters love helping others and this drives many of their adventures. Regal Academy – the hilarious, fresh and funny show that follows the adventures of Rose Cinderella – is back for a second series, after the first wowed the world. In series one Rose found herself enrolled in the Regal Academy – the school for fairytale characters – and enjoyed a host of adventures with new friends Hawk SnowWhite, Travis Beast, Joy LeFrog, Astoria Rapunzel and LingLing Iron Fan. Series two sees Rose return from her summer holidays to find plenty more adventures waiting for her – a mysterious new student, a new hero teammate and the evil Snow Queen who wants to trap them all in her Snow Globes! 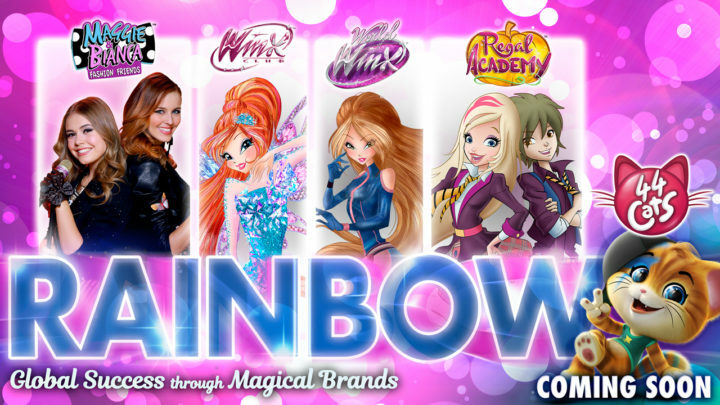 The new series delivers another irresistible mixture of comedy, music and exciting new animation techniques that the millions of Regal Academy fans – from over 100 countries where the series has been sold – will love! Maggie & Bianca Fashion Friends is the new sensation among pre-teen live-action shows. With 78 half hours available – and two TV specials set in Lake Como and Paris – it has surpassed the success of the world’s biggest Telenovelas through its utterly compelling mix of fashion, friendship and music. The show tells the story of Maggie – an ordinary American girl with a dream of becoming the world’s greatest fashion designer – who wins a two-year scholarship at the Milan Fashion Academy. There she meets Bianca, a self-proclaimed Italian ‘princess’, and together they make friends with other students, who all share a passion for fashion and music. In series 3, available for TV broadcasting from Fall 2017, the young friends leave Italy to live in America, where they face difficult choices about their future friendship and relationships. The first two series of the show reached millions, through TV broadcast in Italy, Russia, Brazil, France, Germany, Greece, Poland and Benelux, and on Netflix worldwide – leaving fans clamouring for more!